Indian users comprise about 30% of the total volume of the global feature phone market, making it the second largest in the specified field. In 2015, India had 720 million mobile phone users, out of which 320 million were rural mobile phone users. This estimate also included 50 million Smartphone users with access to internet. According to ‘The Rising Connected Consumer in Rural India’, a study by the Boston Consulting Group, this share of rural India will jump to 48% by 2020 . Steps taken by the Indian government recently may make this happen sooner than predicted. Digital India, launched in 2015 by Indian Prime Minister Narendra Modi, aims towards the promotion of digital literacy and creation of digital infrastructure for empowering rural communities. Considering that 58% of rural households depend on agriculture as one of their most eminent source of livelihood, the role of Digital Agriculture needs to be considered within Digital India. The use of Information and Communication Technology (ICT) to support the transmission of localized information and services working towards making farming socially, economically and environmentally sustainable, while contributing to the delivery of nutritious and economical food for all – this comprises Digital Agriculture. This has also led to the rise and development of mobile apps which are helping existing government schemes, and other agriculture-based information to reach farmers in rural India. This digital change is acting as a game-changer for Indian agricultural conditions. Launched by the PM Narendra Modi in 2016 to work towards empowerment of farmers and development of villages, the app design is neat and offers a user-friendly interface. It provides information on current weather and also the forecast for the next five days, market prices of commodities/crops in the nearest town, knowledge on fertilizers, seeds, machinery etc. The option to to use the app in different languages makes it more widely accessible. This app was launched in 2015 and is managed by IFFCO Kisan, a subsidiary of Indian Farmers’ Fertilizer Cooperative Ltd. Its aim is to help Indian farmers make informed decisions through customized information related to their needs. The user can access a variety of informative modules including agricultural advisory, weather, market prices, agriculture information library in the form of text, imagery, audio and videos in the selected language at profiling stage. The app also offers helpline numbers to get in touch with Kisan Call Centre Services. RML Farmer is a one of its kind agricultural app where farmers can keep up with the latest commodity and mandi prices, precise usage of pesticides and fertilizers, farm and farmer related news, weather forecast and advisory. Its also provides agricultural advice and news regarding the government’s agricultural policies and schemes. Users can choose from over 450 crop varieties, 1300 mandis, and 3500 weather locations across 50,000 villages and 17 states of India. It works with the help of specific tools designed to analyze or provide information on different aspects of farming habits. Eg. CropDoc helps the farmers in identifying problems that affects their crops at the right time and suggests corrective actions; Farm Nutri provides general and personalized nutrient recommendations, which are presented in the form of a schedule of fertilizer dosage. This app was launched in 2016 by the Union Agriculture Minister and aims to help farmers to get information about technologies developed by Indian Agriculture Research Institute (IARI), which will help in increasing returns to farmers. The app also provides farmers with information related to new varieties of crops developed by Indian Council of Agriculture Research (ICAR), resource conserving cultivation practices as well as farm machinery and its implementation will help in increasing returns to farmers. It provides complete information on Crop Production, Crop Protection and all relevant agriculture allied services. It also enables farmers to access all the information related to “High value, low product” category crops from varieties, soil/ climate, to harvesting and storage procedures. An option to chat with experts, video-based learning, the latest news, online markets for fertilizers, insecticides etc. are also available on this app. ‘Kheti-Badi’ (खेती–बाड़ी) is a social initiative App. It aims to promote and support ‘Organic Farming’ and provide important information/issues related to farmers in India. Agriculture today is heavily dependent on genetically modified seeds, chemical pesticides and fertilizers; this app helps farmers to switch their chemical farming into organic farming. However, this app is currently only available in four languages(Hindi, English, Marathi and Gujarati). 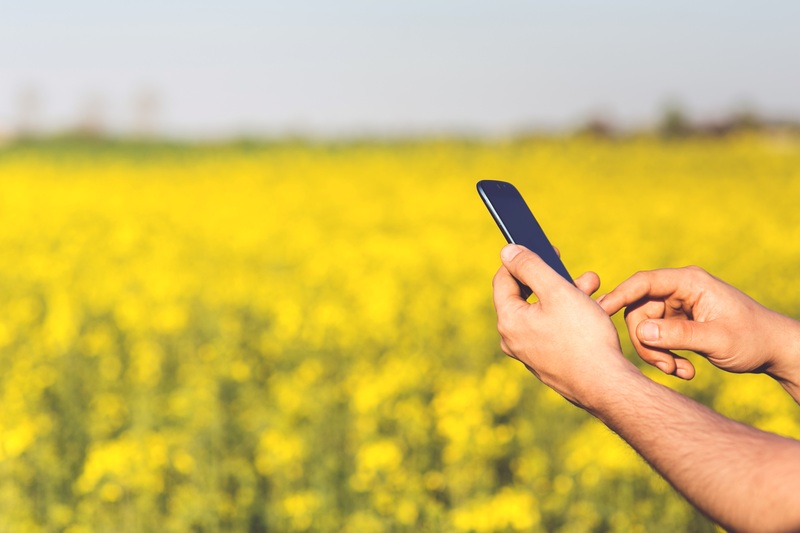 It may come off as a surprise to many, but one of the most widely used app for texting is bridging gaps between farmers. Departments of Agriculture of a few states have used this public platform to make groups called Progressive Farmers’ which connects sons of the soil through their android devices. It initially started with groups of top officials with android phones and was later introduced to agricultural communities. Works on a similar aspect as Whatsapp communication but is considered to be better as it doesn’t require mobile numbers of individuals to stay connected. Apart from providing general information on farming, this application enables Indian farmers to connect with Krishi Gyan experts and ask them questions related to farming, and get answers within the application through notifications. The farmers as well as agriculture enthusiasts can also share their answer with each other. The app helps farmers to calculate insurance premium for notified crops and provides information cut-off dates and company contacts for their crop and location. It can also be used to get details of normal sum insured, extended sum insured, premium details and subsidy information of any notified crop in any notified area. It is further linked to its web portal which caters to all stakeholders including farmers, states, insurance companies and banks. Launched along with the Crop Insurance app by the government of India, the app has been developed with an aim to keep farmers abreast of crop prices and discourage them to go for distress sales. Farmers can get information related to prices of crops in markets within 50km of their own device location using the AgriMarket Mobile App. Other apps like SmartCrop, Mandi Trades, Kisaan Market serve as an online marketplace providing space for farmers to sell their produce after collecting information regarding market prices and for customers to compare and buy produce. State specific apps narrow down the user base and help to provide information regarding a specific area. Farm-o-pedia for Gujarat, AgriSmart for Punjab, Krishi Suchak for Karnataka are a few examples of such apps. All these mobile apps are helping reduce transportation, corruption and transactional waste in agriculture and also offer a gateway for resource sharing for farmers. Thus, the apps are helping boost overall business performance and reducing negative environmental impacts of farming. Now, with a click of a button, farmers can access information regarding weather, dealers, market prices, plant protection, agro advisories, IPM practices etc. Thus, these advancements will definitely help bring significant change in the lives of farmers and the field of agriculture.